DAY 5 Yalta. (Sun. )Included Yalta Tour. Disembark after breakfast for your Yalta city tour. 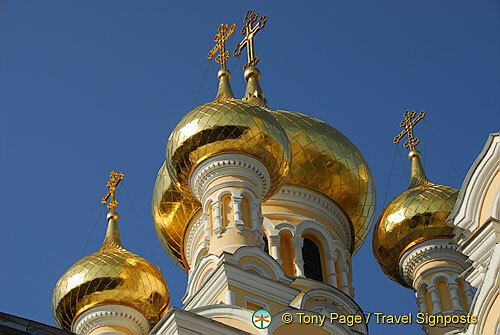 Travel along the Lenin Embankment and to the Alexander Cathedral. During your tour, you also visit the White Palace in Livadia, a former summer palace of Czar Nicholas II and site where Churchill, Stalin and Roosevelt met in 1945 and determined the shape of post-World War II Europe. Your guided tour takes you through the official halls and private apartments of the czar’s family.Yalta Leisure Time & Optional Tour. Lunch is served back on board the ship, and the afternoon is at leisure to explore on your own. You may want to join an optional tour and tasting at the Massandra winery. The Massandra wine-producing estate is the most important enterprise in the Massandra agricultural area. You will tour the unique wine cellars where dry, dessert and liqueur wines mature in oak barrels. The cellars hold more than one million bottles of exceptional quality wine and are listed in the Guinness Book of Records. Learn about the history of wine making, visit the museum and enjoy a tasting of different wine varieties (cost of the optional tour is the equivalent of €23, which includes coach transportation, a guide and a one-hour wine tasting). 04:00 The river boat sneaks into Yalta harbour early this morning. This is a deep water harbour and the boat is able to moor at the embankment. 09:00 Departure for shore excursion. We have a city tour of Yalta and then a photo opportunity stop at Swallow’s Nest to see the love castle of Baron Steingel. Next we make a visit to the historic White Palace in Livadia. You’ll get to see where Churchill, Roosevelt and Stalin sat as they discussed how they were going to carve up Europe during the 1945 Yalta Conference. Livadia Palace was also the summer palace of Tzar Nikokas II and a walk through the official halls and private rooms gives an insight to the lives of the royal family. Very interesting visit. After the guided tour of the Palace, there’s time to walk around the compounds and gardens of the Palace and take snaps. We return to the boat for lunch at 13:00. At 15:00 Massandra winery has been postponed to the day after and instead today’s optional tour is to Chekhov’s House. There’s a video presentation on Chekhov’s life which was a little disappointing as it was played on a TV monitor. It was a bit difficult for the whole room to see and listen to the video. You then have time to walk around the beautiful garden. Dinner at 19:30 as usual and entertainment tonight was a quiz at 21:00. Prize was a bottle of Ukrainian champagne and guess who won it! !